Our taught Masters course in Public History and Cultural Heritage (1 year full-time, 2 years part-time) is designed to provide students with a rigorous grounding in public history and to prepare high-calibre graduates in a unique and thorough fashion for the management of cultural heritage. 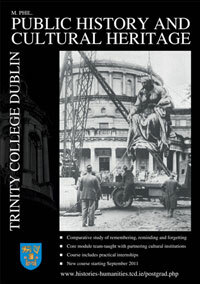 We define 'public history' and 'cultural heritage' broadly. The course involves analysis of cultural memory, its construction, reception and loss; and study of the public status and consumption of history in modern society. Political issues surrounding public commemoration and 'sites of memory' are examined and the role of museums, galleries and the media in shaping public perceptions of the past is considered. The course also surveys the more concrete questions involved in the conservation, presentation and communication of the physical heritage of past cultures, particularly where interpretation and meaning are contested. In a variety of modules, students are trained in the analysis and the presentation of their research findings. They are also introduced to the methodological challenges of advanced study and research at postgraduate level. The course includes a compulsory core module, entitled 'Remembering, Reminding and Forgetting: Public History, Cultural Heritage and the Shaping of the Past', which runs across both terms. A suite of term- long electives is available on substantive themes. A three- month internship, located in one of our collaborating institutions, runs throughout the second term. Practitioner workshops are held in the second term and provide an opportunity for national and international 'public historians' to discuss their work with the class. In any given year this may include novelists, artists, museum directors, or heritage and tourism policymakers. The course concludes with the production of a dissertation or major project, individually supervised by a member of staff. Applications should be made online through www.tcd.ie/courses/postgraduate/faculty where up to date information on fees is also provided. Bursaries are sometimes available: please consult the course web pages. Offers will be made on a rolling basis from Jan 31, and potential applicants are advised to make their full applications as early as possible to avoid disappointment. Since places on the course are limited, applicants may be interviewed or asked to submit a writing sample.